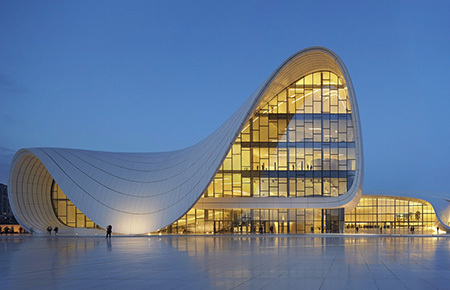 The Heydar Aliyev Center, completed in 2012 and named for Heydar Aliyev, a former president of Azerbaijan, is a 619,000-square-foot building complex and designed by Iraqi-British architect Zaha Hadid. The curved-style complex in which sharp angles are eschewed houses a conference hall, a gallery hall, and a museum, and is located close to the city center. The Baku Convention Center, completed 2015 and designed by Austrian architectural firm Coop Himmelb(l)au, is a multifunctional building with clearly structured yet flexible and spacious rooms and public areas. 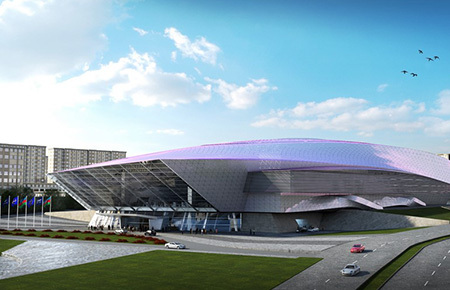 The heart of this international conference center is the auditorium for 3,500 visitors that is flanked by 15 conference rooms and networking areas.